Corrosion under insulation can be the cause of more than just unscheduled downtime and ruined process materials. It can also result in hazardous leaks. Depending on the materials being transported in a facility, a leak could be one ignition source away from a fire that causes hundreds of thousands of dollars in damage and jeopardizes hundreds or even thousands of lives. Given these high costs of CUI, it’s no surprise the corrosion industry spends millions every year trying to mitigate the problem. As we mentioned in an earlier post, a reliable, quality high temp coating is one of the most important steps in combatting the problem of CUI. That said, not all conditions are created equal when it comes to fostering the presence of CUI, and some areas and aspects of your facility should attract extra attention when it comes to inspecting for CUI. Here are a few factors that put an asset at increased risk of CUI. The physical layout and orientation of an asset has a definite bearing on how likely it is to succumb to CUI. Because the corrosion is most often the result of an unwanted moisture buildup, places where gravity leads to moisture being channeled are naturally at a higher risk. This may occur in the elbows of piping or near attachments that provide flat surfaces or indentations for moisture to settle. 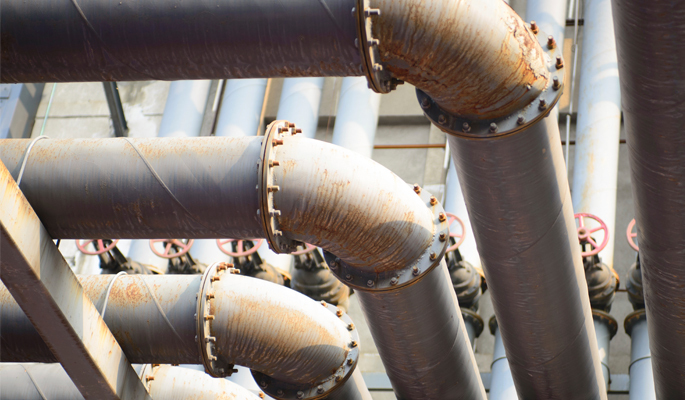 For vertically oriented piping, the bottom of the system is an obvious point of concern, whereas on horizontally oriented pipe it is the underside, or the so-called “six o’clock position,” that presents the biggest threat. This also applies to areas that, because of the layout of equipment in the facility, may experience increased levels of moisture relative to other areas. These include, process material spillover areas, areas adjacent to steam vents, spray from cooling towers, deluge systems and so on. These areas should be inspected frequently for CUI. High operating temperatures are the conditions that lead to CUI being a consideration in the first place. While it can occur between a wide range of temperatures, it’s often said that the most susceptible range is between 120 and 200 degrees Fahrenheit, though this of course depends on the substrate and amount of moisture present. The local climate also has a bearing on the susceptibility of equipment to CUI. Assets located outdoors in tropical or semi-tropical environments will require more frequent inspection than those in arid environments. Equipment in coastal environments should be thoroughly inspected often, and should also utilize coatings that account for the constant presence of moisture. How often maintenance is performed on a facility will have a major effect on how successfully it stands up to corrosion. As mentioned earlier, a regularly scheduled coatings maintenance plan is not simply a strategy for preventing monetary setbacks from time lost to equipment out of commission or ruined materials. Facility upkeep is mandatory for ensuring the safety of staff operating near equipment that could be rendered faulty by CUI. It is extremely important to frequently monitor the state of the insulating layer, as this is the first line of defense against the presence of moisture. Are there any obvious cracks or seams that would easily allow moisture to seep between the insulation and the substrate? Are protrusions such as valves and nozzles adequately sealed? Are there any obvious signs of damage to the insulation? On the substrate itself, it’s important that it be protected with a high temp coating that is operating within its designated temperature range. How old is the coating? Has either it or the pipe itself exceeded its service life? If the age of the coating is uncertain, it may be a smart bet to plan on replacing it, especially if there are obvious signs of degradation. For a variety of reasons, some equipment or areas of a facility will be more susceptible to CUI than others. These areas should be closely monitored and marked as eligible for risk-based inspections. If you are an engineer or facility manager interested in a second opinion from a NACE-certified coatings professional, we would be happy to conduct a free, on-site survey of your facility. Simply get in touch with us through our Request a Consultation page. Recently we discussed the basics of high temp coatings. These coatings are often used in process facilities such as refineries, oil and gas, and petrochemical plants. One of the main uses of high temp coatings in these facilities is for the protection of pipe systems that regularly transport various materials at high heat. 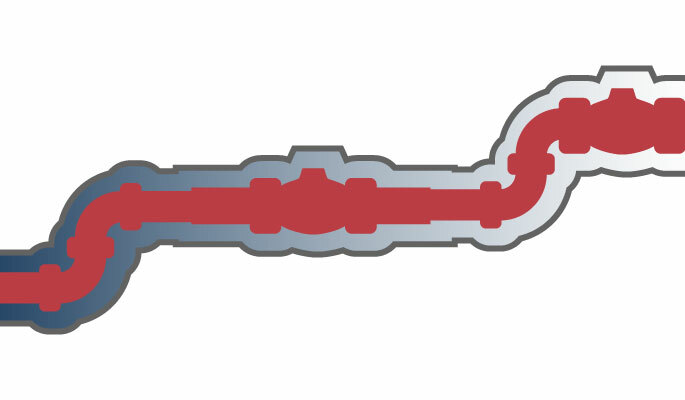 In order to increase efficiency, reduce heat loss and capitalize on energy savings, these hot pipes are usually covered with a layer of insulation. This insulation is also sometimes put in place to protect personnel from being burned by these pipes. Unfortunately, it is this layer of insulation that helps to create the conditions for one of the most vexing corrosion problems in the industry, known as corrosion under insulation, or CUI. CUI occurs when moisture becomes trapped in the area between the hot pipe and the thick layer of insulation surrounding it. Since this moisture is unable to escape, prolonged contact between it and the steel substrate accelerates corrosion. Whether it enters through cracks or holes in the insulation, this trapped moisture has the potential to cause rapid rusting and corrosion on the pipe’s surface. Since the layer of insulation completely surrounds the pipe, corrosion under insulation often goes unnoticed. When the insulation is finally stripped from the pipe, either to investigate a problem or as part of a scheduled replacement, facility managers sometimes find the pipe to be completely ruined. Because of this risk of accelerated CUI, great care is taken to make sure that the insulation surrounding a pipe is completely enclosed. Joints, terminations and other irregularities along the length of the pipe are carefully sealed. Nevertheless, moisture does penetrate insulating layers with some frequency. As a result, CUI has become something of a hot topic in process facilities. Facility managers are constantly on the lookout for the magic bullet that will eliminate the problem of CUI. As of now, no magic solution exists for the problem of CUI. The best plan for battling the problem entails checking piping under insulation often as a part of a scheduled coatings maintenance plan, sealing insulation with care, and most importantly, choosing a high quality high temp coating. It’s important to verify that the high temp coating you choose has been specifically designed to stand up to high temperatures and to defend against CUI. Also, that it is designed to withstand the range of temperatures the substrate will subject it to. When chosen to match these criteria, high temp coatings are the most effective method for fighting CUI currently available in process facilities. Successful painting projects are about more than just paint. Here’s our guide to crafting an industrial painting program from start to finish. Download this handy reference for our full line of tank linings, system selection guide, chemical resistance guide, ancillary products and case histories.